Welcome to the Table of Contents of my online series of essays entitled The Theology of Calvin and Hobbes. Last school year I wrote a series of essays for an "online book" about The Theology of Peanuts. I had such fun with that project and so many of you enjoyed it that I thought I'd offer up this sequel, The Theology of Calvin and Hobbes. I grew up with Peanuts so that was a natural place for me to begin, but during the writing of The Theology of Peanuts many of you (mostly former students of mine) expressed your fondness for Calvin and Hobbes. Demographically, this makes sense. 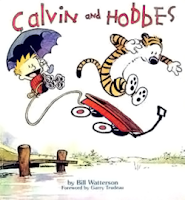 Calvin and Hobbes appeared from November 18, 1985 to December 31, 1995. I was in college and graduate school during those years, a bit too busy to notice or keep up with the Calvin and Hobbes phenomenon. But for many of my former students Calvin and Hobbes was a large part of their childhood. So I was late in coming to Calvin and Hobbes, but after The Theology of Peanuts I was looking for something new to explore. Consequently, I promptly went out and purchased The Complete Calvin and Hobbes and sat down to read. The three volumes of The Complete Calvin and Hobbes weighs over 22 pounds, but it is a beautiful bit of publishing. I sat, read, laughed, and pondered through the spring and summer. I now count myself to be a fan of Bill Watterson's genius. My affection for Calvin and Hobbes now rivals my love for Peanuts. So welcome to The Theology of Calvin and Hobbes. Chapter 1: "Virtue needs some cheaper thrills." Chapter 5: "Quit playing with your oatmeal and eat it." Chapter 9: "I can't figure out this death stuff." Chapter 11: "The world seems like a pretty mean place." Chapter 13: "All shall be well." This is one of the best books that I’d recommend to my friend. There are lots of lessons that we can take from this book. I think our children should also read it. Are you kidding me?!?! I am so excited about this. WHOOT! Love C&H. I am so glad I came across this article. What to my suprise started with a Merton quote. So I am already sold. Thanks.